I am using git as my revision control system. To do so, I installed msysGit to checkout my repositories on MSW. Now I want to compile my programs with MinGW and found this "problem" for me: When I install MinGW and MSYS via mingw-get I can compile my program, no problem. But I can not access git. When I use the Git Bash, I can work with git, but can not compile. to set "links" between both installations to make it work. I would prefere the way I can keep both packages up to date more easily. How did you install Msysgit? Did you choose the third option in the screen where it asks for PATH setup? You have to choose the third option or even second might suffice. Anyway, it's all about setting proper path to the git.exe in msysgit, or am I missing something? You can add a symbolic link to git in MinGW, if you chose the second option. This will create a symbolic link called git in MinGW's /usr/bin pointing to the msysgit installation. 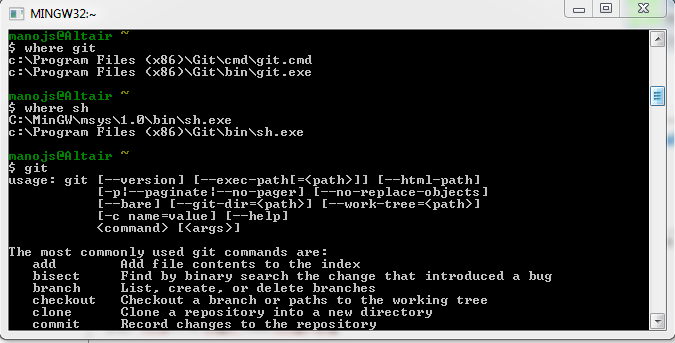 Then you can use the git command anywhere from the MinGW shell. You need to fix up the PATH so that you are running the external commands that match the msys or msysgit environment. Depending on how you installed these two shell environments one of them will be first in the PATH so regardless of which bash you are running you will be running external commands from the bin directory which is first in the PATH. You can test this by running ls.exe from the different bash shells, I found one worked and one didn't but when I fixed up the PATH they both worked. You actually only need one script as one environment will work, but I also installed RubyDevKit which had the same problem so it seemed simpler to create a script for each environment. 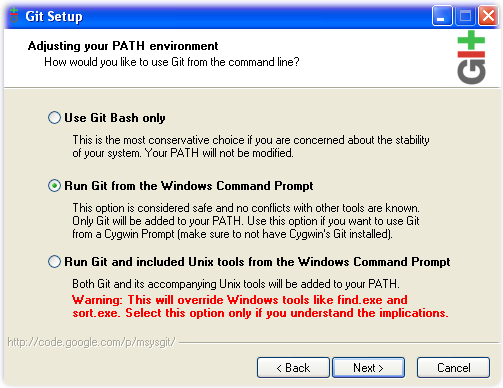 In windows run, type "git bash"
Not the answer you're looking for? Browse other questions tagged git compilation mingw msysgit msys or ask your own question. Is it possible to make a batch file for Git Bash? How can I capture group from string using regexp in shell in msysgit on Windows?